Pibbs 5005 Reception Desk - Features a sophisticated design that sets the tone of your reception area, and gives your client a great first impression. This desk is 4 feet in size with a wraparound check ledge. The back features two drawers, one for storage ant the other drawer is locked. 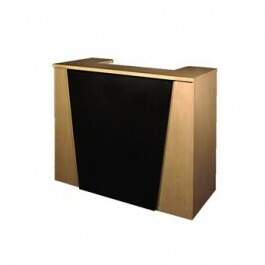 The 5005 reception desk is perfect for smaller salons or areas where a small greeting station is desired. The laminated used is light maple with black accents.